Since 1967, there has been an agreement among 107 countries that prohibits the use of biological, nuclear and chemical weapons from outer space. 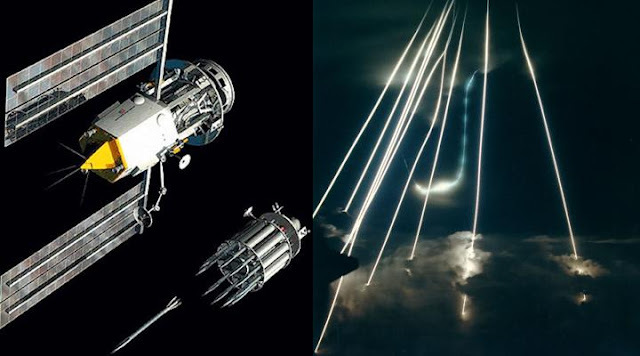 THESE AIR FORCE 'RODS FROM GOD' COULD HIT WITH THE FORCE OF A NUCLEAR WEAPON The Air Force now draws new attention with their latest weapon development: super-strong tungsten rods that can be fired from space to any city on Earth. These can hit their targets with a force comparable to that of intercontinental missiles, reports the military news site „We Are The Mighty“. LEARN MORE ABOUT PROJECT THOR, NICKNAMED 'RODS FROM GOD' THE WEAPON GAINS PENETRATING POWER DURING THE FLIGHT PHASE They work like bullets shot from pistols or rifles - with one decisive difference: by being fired from space, they do not lose speed and energy, as in the case of horizontal shots on Earth. Rather, the tungsten rods gain more and more power during the initial flight phase in space, which gives the impact even more penetrating power. The tungsten projectiles are about six meters long and reach a speed equivalent to six times the speed of sound. This allows the rods to penetrate several dozen meters into the earth and thus are also able to destroy deep bunkers. In conclusion, the explosive force is comparable with nuclear weapons - only without the fallout. Is that the "fire, fury and power the likes of which the world has never seen" the US President was referring to lately?